For at least the first year or so, babies have no understanding of behaviour or misbehaviour. 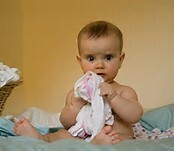 There is no such thing as a naughty or bad baby – just a baby who is doing things that adults find inconvenient, annoying or painful. But, in the first year or so, you can lay the foundations for a happy and well-behaved childhood. It all depends on how you respond to what your baby does. My baby is doing something I don’t want! Babies do all kinds of things that we wish they would not. They crawl off somewhere, grab something, pull hair, mash or throw food, refuse food, throw toys, and so on. It can feel like it is on purpose – but it is not. Babies just don’t have the brain structures for being naughty. What is usually happening is that your baby is doing exactly what he or she is meant to do, which is to explore the world, and try things out. never rely on discipline to keep your baby safe. If there is a hot stove in reach, your baby will make a bee-line for it, and saying stop will not be enough. Make sure your house is baby proof! if you can, just accept what your baby is doing. See it as exploration. If your baby is mashing the food around, then finger practice is clearly more important to him or her at the moment than eating. Let them do what they need and then they’ll be ready to do what you want. Finally, look out for the time, sometime after 11-12 months when your baby will start to tease you. This is part of how he or she learns about cause and effect, but it is also for fun! Could be by throwing things down to see you pick them back up, or refusing a toy or some food. Enjoy the joke – it is OK to stop the game after a while!